This is a free songwriter showcase featuring some of the central coast most influential writers and performers! It will be an honor for us to present to you one of the most influential singer/songwriters of the Central Coast of California. Uncork the Mic is a unique event that promotes creativity and relaxation by creating a listening room environment. That is why this is a safe place for a songwriter to share from the depths of their soul…you’ll hear from Jill like never before during “The Intimate Interview with the Artist” segment of my show, as well as through her music. Jill Knight’s soulful sound is unmistakable. A native of Savannah Ga, her music delivers a southern texture blending americana, blues and weaving in a little R & B that will take the listener on an unforgettable journey. Nominated for the LA music awards “best female vocalist”, finalist at the Telluride Troubadour competition, a finalist at the National Academy of Songwriters “songwriter of the year” competition, finalist in Billboard magazines, “best unsigned band” contest, a regional best seller in Album Network magazine for her cd Future Perfect, best DIY albums in Performing Songwriter Magazine, Honorable mention NSAI songwriting competition, Finalist in the Acoustic Live songwriter competition. Jill has toured and shared stages with… India Arie, Shawn Colvin, David Wilcox, John Prine, The Tubes, The Doobie Brothers, Roger McGuinn, Laura Nyro, Chris Isaak, Delbert Mclinton, Michael Hedges, Phoebe Snow, Richard Thompson, Little Feat, David Lindley, Los Lobos, Peter Rowan and many others. Sign-ups have begun via UncorktheMic@gmail.com. 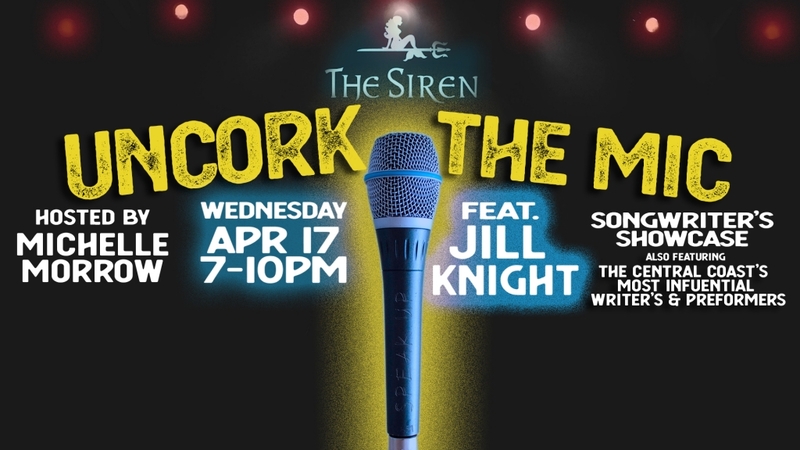 To reserve your time slot during the Open Mic Session send your email inquiry to UncorktheMic@gmail.com.